Arthur`s Quay Park is situated in Limerick City Center, opposite the Arthur`s Quay Shopping Center and on the banks of the River Shannon. It was opened on the 1st January, 1991, by Ms Mary Robinson, former President of Ireland. 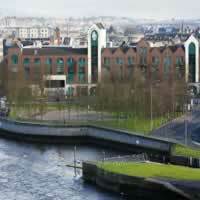 There are excellent views of the River Shannon, Curragour Falls and Clare Hills from this park. A new weir was built in recent years to allow boats access between the Abbey River and Shannon Estuary. This weir bounds the park. A small marina is located nearby. The city riverside walk also passes through the park. Twenty five years ago this garden was surrounded by open fields, today it extends to approximately 4 acres, lying close to the River Shannon. Soil depth is critical, as this is a limestone area with stone outcrops close to the surface. The garden is designed as a series of small gardens, all inter-linked. One garden has a laburnum walk planted with lavender, while another has vegetables and a third is full of soft fruit and flowers for picking. 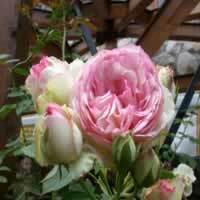 Throughout the garden there are many varieties of shrub roses. May and June are months when the garden is full of flowering trees and shrubs, while the other months have many other interesting delights. The garden is open by appointment only. These award winning gardens, one acre in size, overlooking the tranquil River Shannon in Mountrenchard, are a gardener’s paradise. The Boyce family has developed the extensive, prize-winning gardens over the course of 20 years. Designed for year-round color, the gardens are divided into a number of informal rooms that provide a micro-climate for the many colorful and tender plants that grow there. The gardens contain rockeries, herbaceous borders, a sunken garden, water garden with fountain, rose garden, meditation garden, vegetable garden, glass house and conservatory with vine, driftwood sculptures, geraniums, fuchsias and cacti arrangements in unusual containers. The Broadford Arboretum is located opposite the church in Broadford Village. Some years ago this disused limestone quarry was used as a dumping ground and then the local Community Council undertook work to develop the quarry as an arboretum. It has been ecologically restored for native trees and shrubs of Irish genetic provenance. It is also managed with wild life in mind. The arboretum for native trees and shrubs. These are of Irish genetic provenance. This woodland is the natural home for many wild plants and animals. 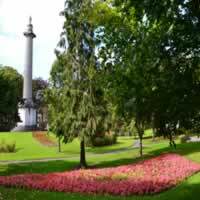 The Celtic Park and Gardens are a fascinating fusion of history and horticulture. Ancient monuments and buildings are combined with parkland and gardens. There`s a stone circle, a dolmen, a lake hut, an ogham stone, a communal tomb and a Celtic chieftain`s chair. The gardens are planted with native plants and wildflowers including rare wild orchids. Other more formal attractions include roses, a lily pond, an herbaceous border and a shrubbery. A coffee shop offers wonderful views of the beautiful Limerick countryside. The Celtic Park and Gardens are located close to Curraghchase Forest Park. This park covers 773 acres of mixed woodlands, park land and lakes which together provide a rich habitat for a diverse range of animals and plants. The woodland estate and lakes around the shell of 18th century Curraghchase House, home of poet Aubrey de Vere, is as a State forest and park. In the vicinity are the turrets and towers of the 19th century castle built by the Earl of Limerick and close to the castle the little Killulta church said to date from the 9th or 10th centuries. Northwest of Curraghchase House is the ancient Killeen church. 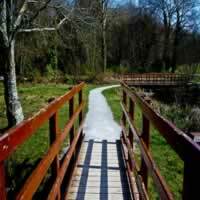 Facilities Include: 5 miles of multipurpose waymarked trails, suitable for bicycles and walkers Multi-access Lake Walk (1 mile) and Arboretum walk (0.75 mile) suitable for buggies and wheelchairs. Walks: There are a number of trails in the park: a trail of approximately 2 miles takes you around the lake and gives you the opportunity of visiting the de Vere monument overlooking the lake. There is also a garden walk incorporating some specimen trees and a children`s playground along the way. Tree Species: There is a large area of mixed There is a large area of mixed woodlands, the greatest part of this site consists of large stands of beech, ash and oak. The oldest of these trees is about 200 years old. A large area of Norway spruce trees has also been planted. The Foynes Recreaction Site is one of the Discovery Points on the Wild Atlantic Way. It is a pocket of mixed woodland of just over 17 acres located on the banks of the majestic River Shannon. The woodland once formed a mere fragment of the 6,500 acres of the Monteagle Estate, the main family seat being at nearby Mount Trenchard. Remnants of the estate days can still be observed within the property to this day in the form of the old carriage paths, stone walls and the Lady’s Gate at the Eastern access point to the property. There are some twisty paths to explore that offer fantastic views out over the estuary. For the nature enthusiast, the range of tree species includes; beech, sycamore, birch, Douglas Fir and Scot’s Pine. From Poultallin Point scan the waters for bottle-nosed dolphins Tursiops truncatus and otters Lutra lutra. For the historian, take some time to imagine the transatlantic flying boats landing in Foynes around the time of World War II. Located on the southern slopes of the Galty Mountains, the area was once the site of Galty Castle built in 1740 which, with later additions, became the home of the Kingston family. The Castle was demolished around 1940 and the stone was then used to build the local church in Glanworth. The woodland itself, consists of a diverse species block of approximately 1,100 acres. Broadleaves include; oak, ash, beech, sycamore, birch, chestnut, rowan, whitebeam and holly. Conifers include; Sitka spruce, Norway spruce, Scot’s Pine, Western hemlock and Grand fir. Because of the woodlands special and semi-secluded location on the Galty’s there is a rich assortment of wildlife here; deer, fox, badger, stoat, mink, red squirrel, hare and rabbit. 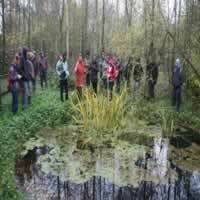 Pheasant, duck, kestrel, barn owl, kingfishers and many species of bat are also present. 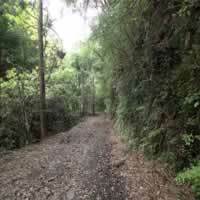 For walkers, the Attychraan National Looped Walk starts and finishes at the car park. This is a really scenic trail that offers magnificent views of the mountains, farmlands and rolling countryside, as well as opportunities to walk through some impressive stands of trees. 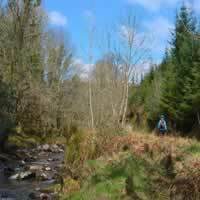 There is a special section beside the Attychrann river that would lift any spirit. 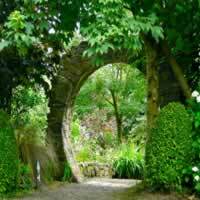 An award-winning 3 acre garden that enjoys a wonderful location overlooking the scenic Shannon Estuary, Knockpatrick Gardens are found just a short distance from Foynes. The dwelling house stands about 650 feet above road level, with the garden descending around this highest point. The gardens are a haven for enthusiasts and contain a variety of color through the collections of rhododendrons, camellias, azaleas, bamboos, primulas, poppies and many varieties of tree ferns and grasses. The garden is divided into different levels with pools and water features among the plants. Roses, clematis, perennials, an arboretum and a large collection of hydrangeas offer interest throughout the flowering seasons. There are many large mature trees including maples, red horse chestnut, palm, oak, monkey puzzle, cedar and magnolia. 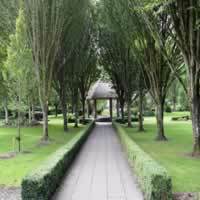 Knockpatrick Gardens were the only garden included in a list of the 10 Best Things to Do in County Limerick and features in the 100 Best Gardens in Ireland. 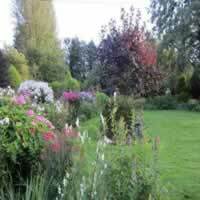 Moanwing Garden is a rural property located in Rathkeale, 7.5 miles from Adare. The prize-winning garden comprises nearly 3 acres of mature trees and shrubs in a farm setting. 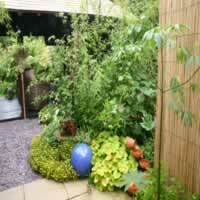 It contains an extensive herbaceous border with many unusual perennials. There is also a pool, pergola and arches covered with roses, clematis, jasmine and a topiary section called 'Animal Farm'. Another hidden gem is the vegetable plot and orchard full of various kinds of vegetables and fruit. Moanwing is open May through September by appointment. The Clare Glens forms the boundary between Co. Tipperary and Co Limerick. 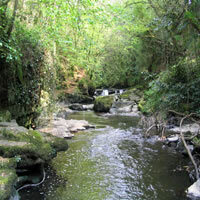 The Glens through which the Clare River flows is a gorge, which provides excellent walks and scenic views from all sides. There are many waterfalls. The Glens are heavily wooded and a nature trail has been mapped in a looped course format, which opens up all areas of the Glens to the visitor. It has miles of walkways and foot bridges over the river. The river runs through a series of waterfalls and rapids which is a most spectacular sight. There are loads of plants and animals to be seen. Beside the Limerick City Gallery of Art, People`s Park, dating from 1877, is a tranquil oasis and the city`s main green space. A large selection of mature deciduous and evergreen trees dot the park and, during the spring and summer, visitors can admire a wonderful display of flowers. Other features include a memorial on a giant pillar to Thomas Spring-Rice (MP for Limerick 1820-1832), a 19th-century bandstand, an ornate drinking fountain, and two gazebos. Terra Nova is a beautifully designed and richly planted garden. A gardener’s paradise, Terra Nova is full of imaginative features and unusual plants around every corner. 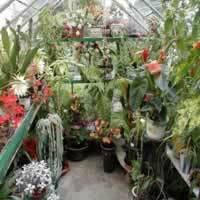 The garden is also home to Terra Nova Plants, a small nursery that specializes in rare and out of the ordinary plants. It has been featured on RTE Radio 'Planting Passions', and twice in both The Irish Garden magazine and the Sunday Times. Terra Nova was also awarded 'Best Garden in the 32 Counties' in the All-Ireland Viking Irish Garden Competition 2005. Terra Nova is open by appointment.